This high-quality cream activates the skin metabolism during the night, at its best to absorb components for its renewal and hydration. In the morning skin is soft and elastic. New improved formula with double the amount of Hyaluronic Acid and hydrating comlex, provides long lasting hydration of the skin, increasing its elasticity and vitality, giving it a fresh and healthy look. Active components and effect: Skin-specific Co-enzyme Q10 plays an important role in cell energy production necessary for the development of basic structural skin elements. Its presence improves existing and prevents new damage to the deeper skin layers. 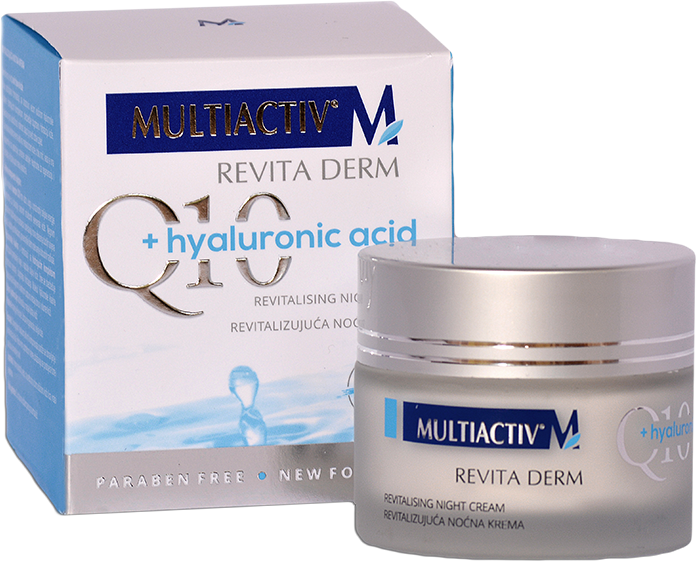 Co-enzyme Q10 is a powerful antioxidant which neutralises harmful effects of free radicals. Hyaluronic Acid combined with hydrating complex to transfer moisture to the deepest layers of the skin, providing immediate and long-lasting intense hydration. Hyaluronic acid molecules binds to the collagen and elastin, and completely restore tone and volume to the skin. Soya and Jojoba oils supplement the lipids deficit in the skin. Vitamin A reduces fine lines. It accelerates skin cell regeneration. Apply every evening on previously well-cleaned face, neck and neckline skin. Aqua, C12-15 Alkyl Benzoate, Caprylic/Capric Triglycerides, Glycerin, Polyglyceryl-3 Methylglucose Distearate, Isopropyl Myristate, Cyclometicone, Butyrospermum Parkii, Glyceryl Stearate SE, Hydroxyethyl Acrylate/Sodium Acryloyldimethyl Taurate Copolymer, Squalane, Polysorbate 60, Cetyl Alcohol, Centella Asiatica, Cera Alba, Glyceryl Stearate, PEG-100 Stearate, Palmitoyl Proline, Magnesium Palmitoyl Glutamate, Sodium Palmitoyl Sarcosinate, Pentylene Glycol, Fructose, Urea, Citric Acid, Sodium Hydroxide, Maltose, Sodium PCA, Sodium Chloride, Sodium Lactate, Trehalose, Allantoin, Sodium Hyaluronate, Glucose, Phenoxyethanol, Ethylhexylglycerin, Glycine Soja, Buxus Chinensis, Methyl Metacrylate Crosspolymer, Parfum, Retinyl Palmitate, Xantan Gum, Ubiquinone. This gentle cream, rich in active ingredients, intensively nurtures and rejuvenates the skin. Synergistically active components achieves the renewaland revitalization of the skin. The gentle formula is scent-free, meaning it is also suitable for people with sensitive skin.